There are many ways to earn points for free flights. Today, I will detail the Southwest Rapid Rewards program. The Rapid Rewards Membership is a program from Southwest that makes it easy to earn free flights and other benefits. There are many different ways to earn and redeem Rapid Rewards points. These points never expire and have no blackout dates. First, you sign up to be a Rapid Rewards member here. Once you're a Rapid Rewards member, when you book a flight on Southwest Airlines, you automatically start to earn points towards your next flight. The way points are determined is based on the cost of your flight fare. You can see the earning simulator here. You can sync your credit card with Rapid Rewards Dining. Every time you eat at a restaurant that is connect with Rapid Rewards, not only do you earn points on your credit card, you also earn an extra 3 points per $1 spent at participating restaurants. There’s also a bonus of 300 extra rapid rewards points that you can earn after your first dining tab of $25. 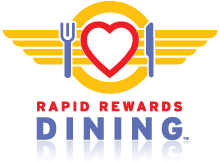 Not every restaurant out there is connected with Rapid Rewards Dining, but many of them are. All you need to do to earn these points is to write a short review of the participating restaurant you ate at after dining. No need to save your receipts, the points earn automatically. When you go through the Rapid Rewards Shopping Portal, everything you buy is the exact same from the online store that you want to purchase from. The only difference is when you check out, you get extra bonus points per dollar applied to your Rapid Rewards account. If you’re going to go through a shopping portal to earn extra points, I recommend going through Chase’s ultimate rewards portal instead. Remember, the points that you earn on your Chase Sapphire Preferred Card be transferred directly to Southwest Rapid Rewards points later. If you’re thinking of renting a car, or staying at a hotel, consider going through Rapid Rewards Partners. You can earn points even faster. Remember, even if you’re paying with your credit card, you still earn points on BOTH your credit card, and your Rapid Rewards account. So now that you’ve earned a bunch of Rapid Rewards points, it’s time to use them. Don't worry, there's no rush as these points never expire. These points spend just like cash towards your next flight. When airline fares go on sale, the points required to redeem for flights is also reduced. You can check the rewards simulator here. As you can see, the “wanna get away” fares are really easy to redeem, only 6,000 points for a free flight. With your points, you are not only limited to flying on a free Southwest Airlines flight. Other rewards that you can redeem these points for include: international flights, hotel stays, cruises, car rentals, gift cards, and more. Sound good? Go here to get started. And remember, if you’re going to be spending money on anything, always pay with credit if you can. This way you can maximize your free rewards as quickly as possible. There are many other airlines with many other point systems. This post is to give you an idea on how you can maximize points on Southwest Airlines.